In her dual identity as accomplished Middle Eastern dancer and classically trained actor, Morgiana Celeste, has performed internationally, in New York, and at regional and stock theaters throughout the US, including such venues as Lincoln Center, the Brooklyn Museum, Paper Mill Playhouse, the Dallas Theater Center, Caramoor Center for Music and the Arts, the Nashville Institute for the Arts, the New York International Fringe Festival, and the Edinburgh Festival Fringe in Scotland. She performs in concerts, clubs, and restaurants, at festivals, corporate and private functions, and special events and in Middle Eastern venues in the northeast. Her acclaimed story theater presentation of Ali Baba and the Forty Thieves was part of the repertory of Lincoln Center Institute and tours to major art institutes and schools as part of arts-in-education programming. Additional arts-in-education tours include Caravan to Cairo and Gypsy Tales. Additionally, she is author of and performer in Banat el Emir or the Dancing Princesses, and Mosaic Dance Theater Company’s The Fisherman and The Djinni. She is Producing Artistic Director for Mosaic Dance Theater Company, a professional touring company presenting programs which celebrate the rich cultural heritage of the Mediterranean countries of Europe, North Africa and the Middle East. Morgiana Celeste teaches group and private classes in Middle Eastern dance, is guest artist/instructor for workshops on Middle Eastern dance and also conducts workshops for storytelling and story theater. 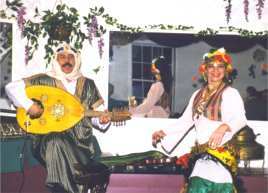 With more than twenty years of experience in Middle Eastern dance, she has studied with Samara, her current teacher and coach, also with Jajouka, Mish-Mish Bint Amira, Phaedra, and the late Ibrahim Farrah. Her performance background includes musical theater, classical acting styles including Shakespeare, and dance training in tap, jazz and various ethnic styles. Additionally, she has studied mime with Robyn Baker Flatt and John Stevens and the Laban movement style with Juana Laban. She has trained extensively in the Shotokan style of karate with Master Sensei Masataka Mori. She has worked as production assistant for several Broadway productions and as artistic consultant to the late Anthony Quinn. Morgiana Celeste holds an MFA from Trinity University and a BA from Lehigh University. For more photographs of Morgiana, click here. More information is also available at the New York Performing Artist Company website.